Cr Calcott said the mites were living on the bats and residents were fearful they could spread disease. 'We know a very small number of bats have lyssavirus and or hendra virus or melaka virus,'' he said. However, the Department of Environment and Resource Management said it had not received any complaints relating to mites. ''Further, Queensland Health advises bat mites do not carry any diseases that can be transmitted to humans,'' a spokeswoman said. The department has refused to grant permission for council to use a helicopter to muster the bats into a new habitat, away from the township, as there was no guarantee the bats would not be harmed. More than 2000 people have signed a petition for the bats' removal. Politicians and business leaders plan to hold a public rally on Saturday. The spokeswoman said the department would consider any application from council for a damage mitigation permit to disperse the flying foxes, as long as the methods proposed were humane and did not impact public safety. 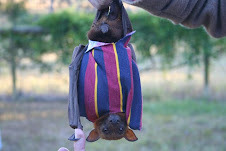 Wildlife Protection Association of Australia Inc.
A Flying Fox in care! Apart from kangaroos, the Flying Fox is one of the most persecuted animals in Australia. Blamed for destroying fruit farmers profits, spreading disease, and some residents living close to flying fox camps complain regularly of the smell. In fact flying foxes are none of these things. Flying foxes are essential polinators of night-flowering rainforest trees, and without them, our forests would be a much poorer place. Loss of habitat has forced flying fox camps closer to residential areas, and houses are being built closer and closer to the camps in the mangroves. All flying fox species populations are believed to be crashing in numbers, mainly through loss of habitat and harassment.